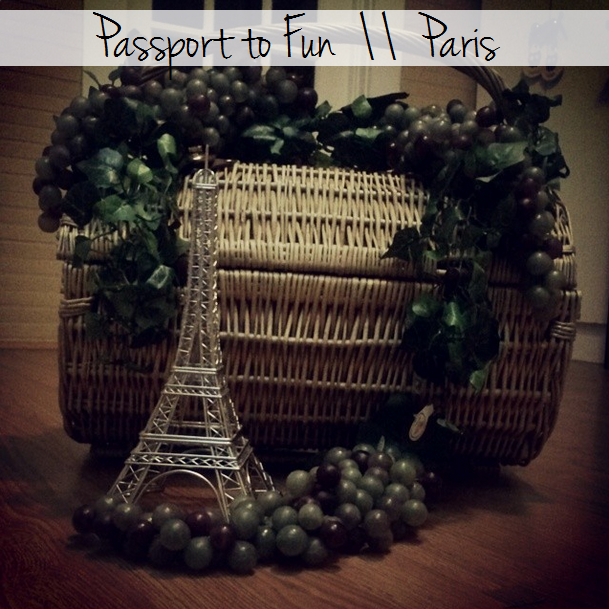 on January 11th we had our first Passport to Fun adventure to Paris, France! to be honest, i wasn't sure how this one was gonna go because i didn't have as much time to prepare for it as i had hoped! 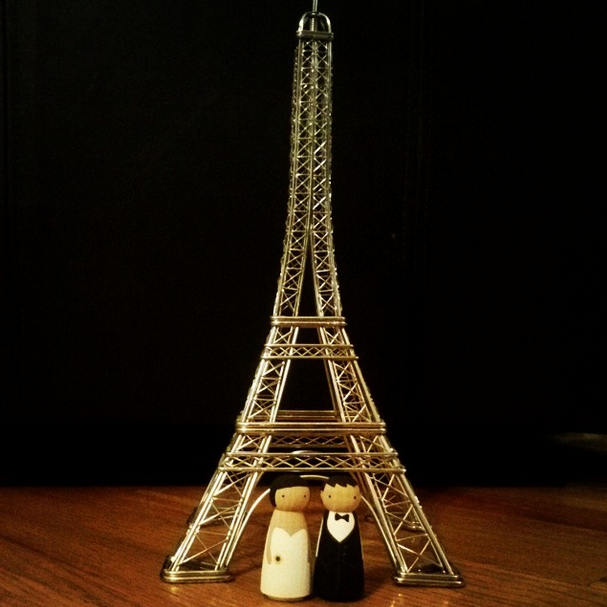 i kept it low key & we had a picnic @ the Eiffel tower in our living room! i was going to rent Ratatouille or Hunchback of Notre Dame to watch for a fun Paris movie. however, a month ago the last Blockbuster near our house closed. so, we went to a movie store near our work & the only movie about Paris i could find was Passport to Paris with Mary-Kate and Ashley Olsen. i was excited because i loved the Olsen twins when i was a kid, but i'm not sure that Thomas was thrilled at the choice of movie. we did watch it & it was cheesy, but it was still fun! we had a photo op in front of the Eiffel tower which was a lot of fun! 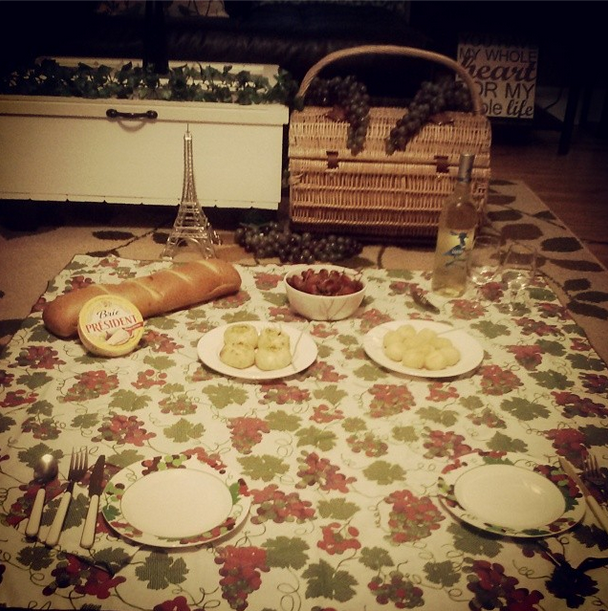 for our picnic we had a baguette & Brie, quiche-like bread bowls, grapes, wine, & puff pastries! 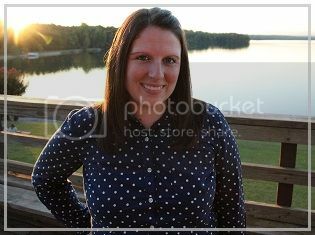 it was our first time using the picnic basket we got for our wedding & it was a lot of fun. plus, Thomas got a stamp for Paris in his passport! That picnic spread is too cute! Thanks for offering the giveaway too; I love Etsy. If you follow @DorcoShai on Twitter you could win one of our own giveaways. We're a shaving company called Dorco and we provide quality razors for 30-70% less than leading brands. See our prices for yourself and read what others have to say about the quality of our razors at DorcoUSA.com. Thanks again for posting, and congrats in advance to the lucky winner! ps in 2014 the thing i'm most looking forward to is growing deeper in my relationships. haha! yes.... yes i did!!! and he watched the whole thing!! i used to own all of the Mary-Kate & Ashley movies & kinda wish i had kept them!! This is adorable and I've loved reading your blog.